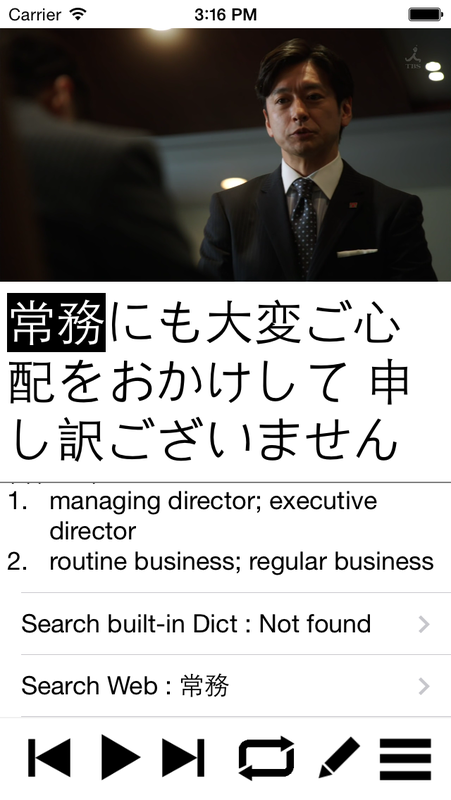 Web Search is an insanely powerful tool in SABU. 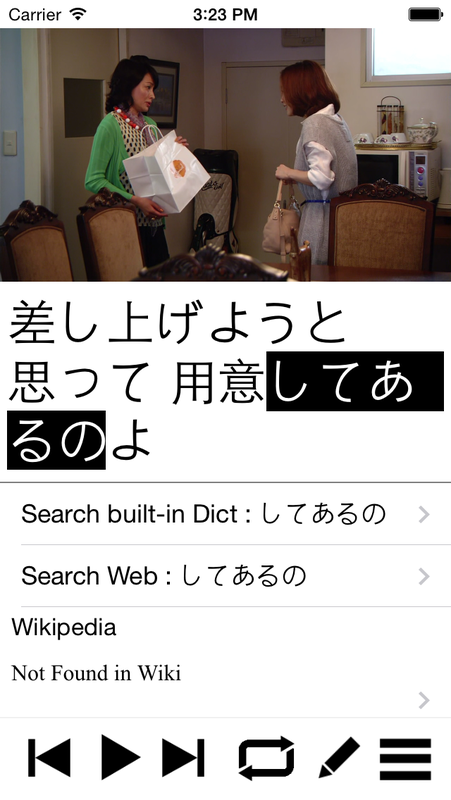 With SABU, we want user to focus on learning rather than switching between Apps to find out the meaning. 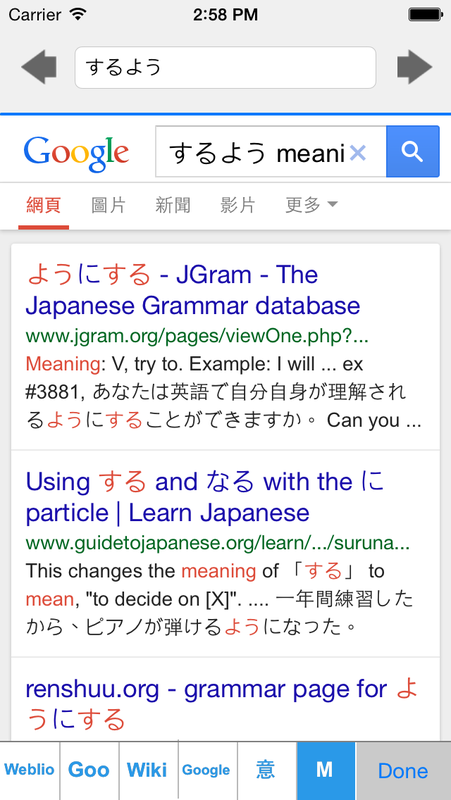 Web search is tightly integrated to SABU. NO TYPING is required. All search would be at most two clicks away. 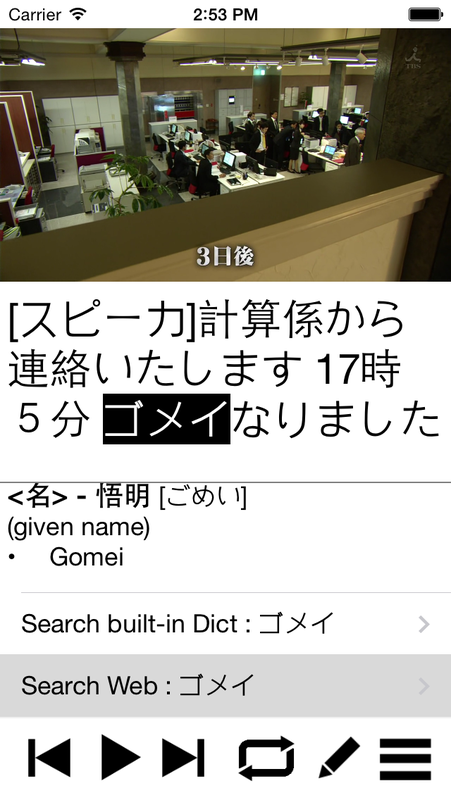 After the dictionary are displayed, you can always find the “Web Search” option. 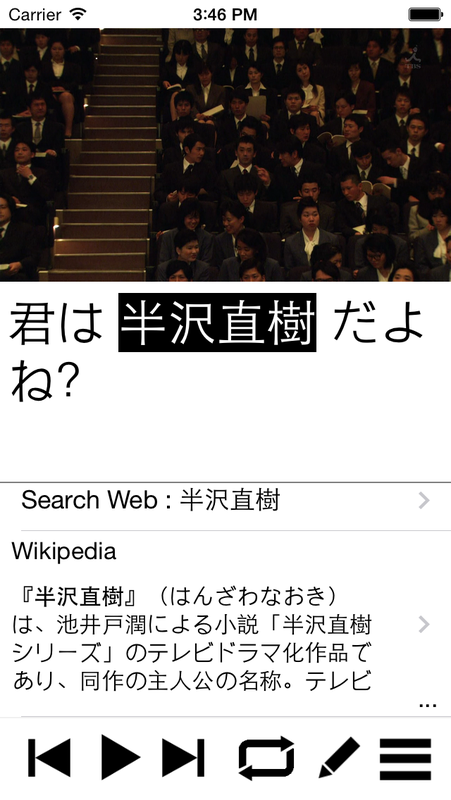 Click it and it will bring up a web browser tailored for searching words in Japanese. Here are some scenarios where you would like to search the Web for more information. 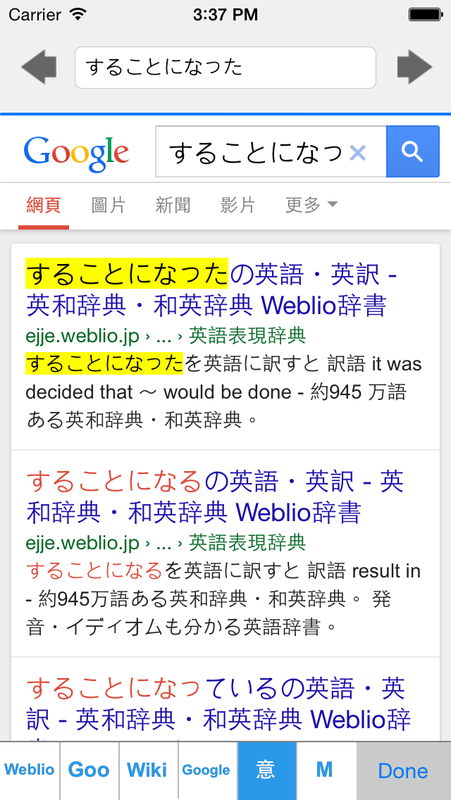 Click “Search Web” and then “Weblio” or “Goo”. 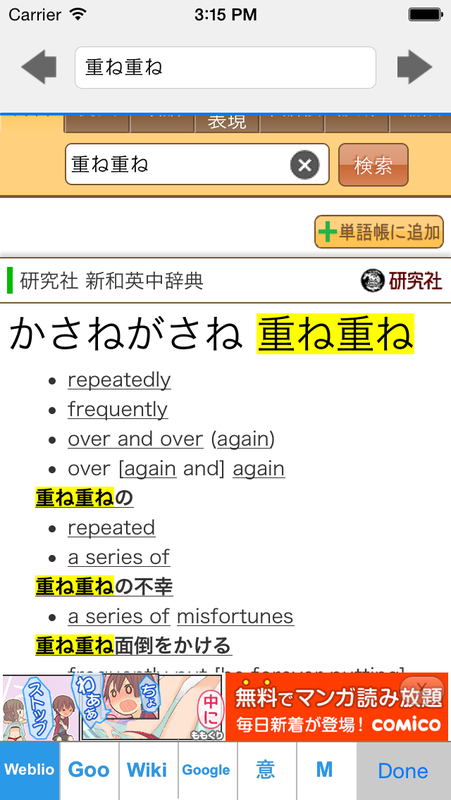 Search word from online web dictionary. 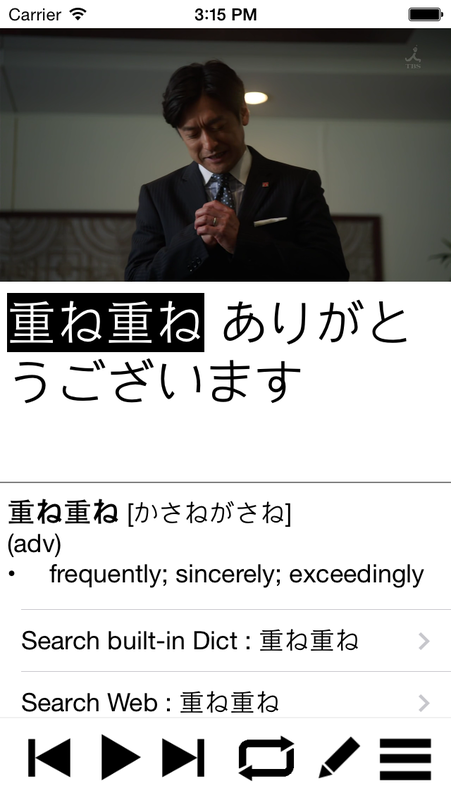 Sometimes you still want to check out and compare the meaning from some online dictionaries. 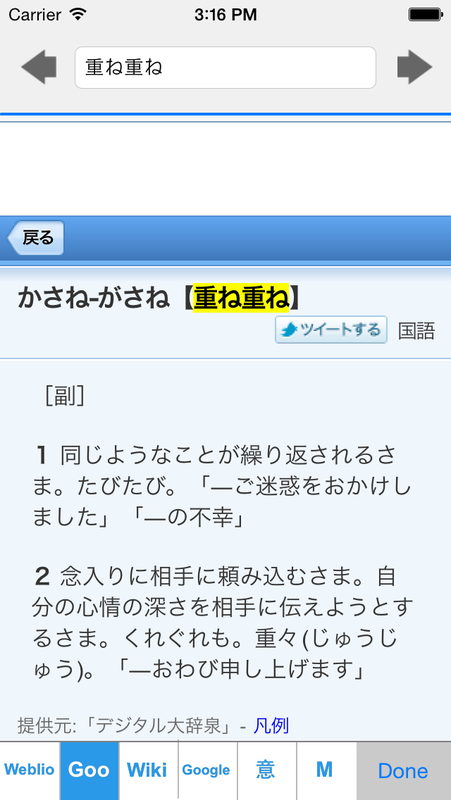 Sometimes, you can’t get the meaning because it’s more related to Japanese culture. 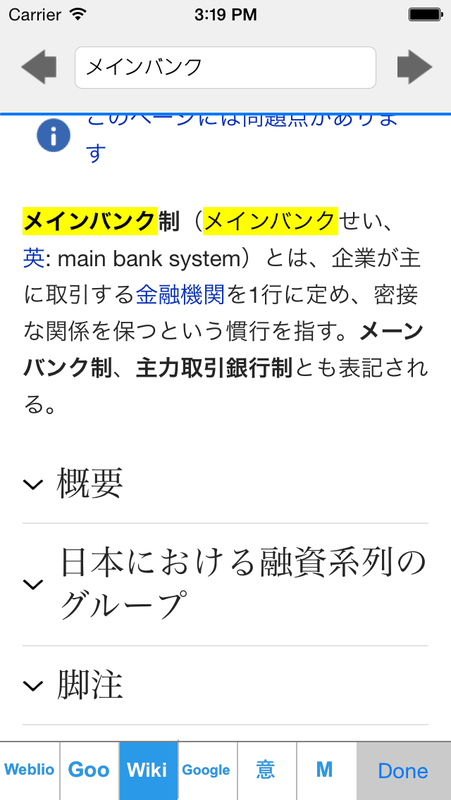 Then Japanese wiki is best tool to learn it in the native way. e.g. 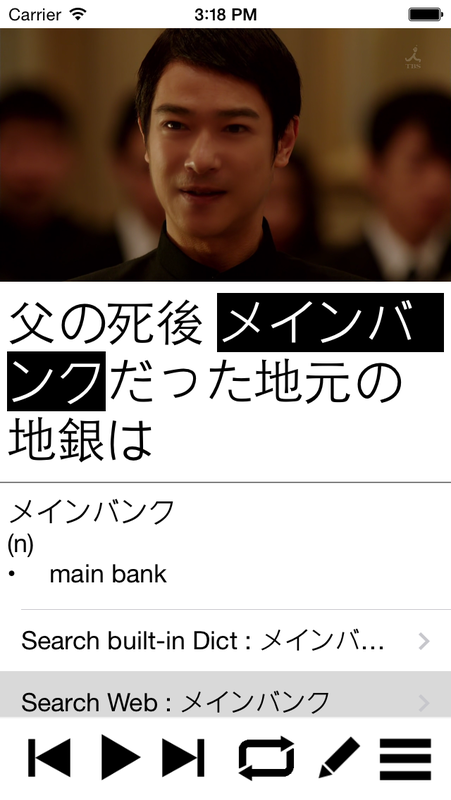 for the “MAIN BANK” word, check out the main bank system and how it works in Japan. 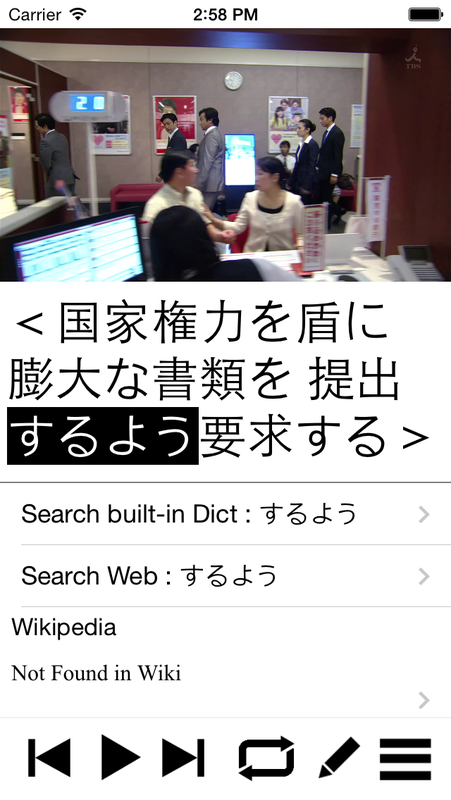 For any words not found in dictionary, they would be automatically searched in Japanese wiki. 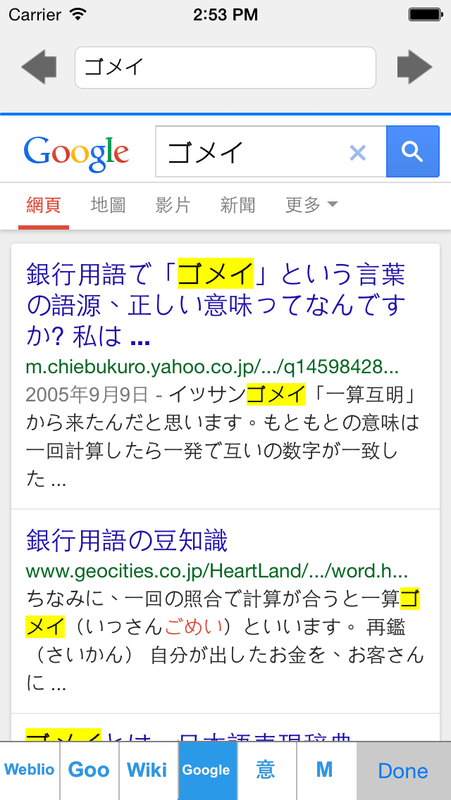 Click “Search Web” and then “Google” or “M”. 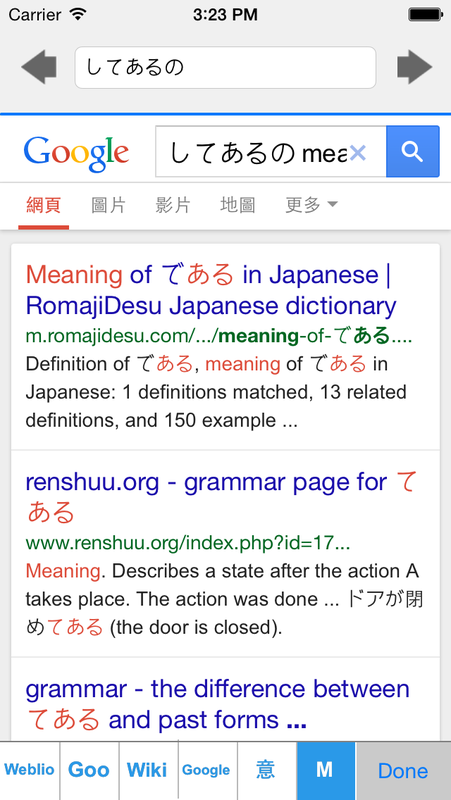 Search the words for “meaning” in Google and it would most like bring you the most useful grammar site for the explanation. 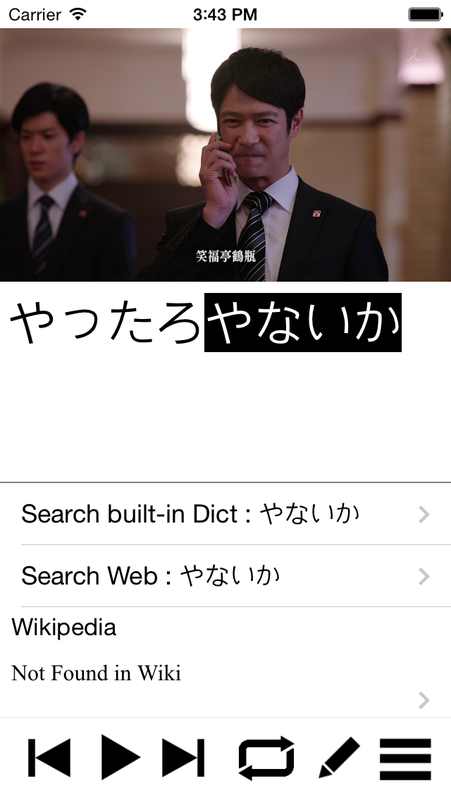 Click “Search Web” and then “M” or “意”. 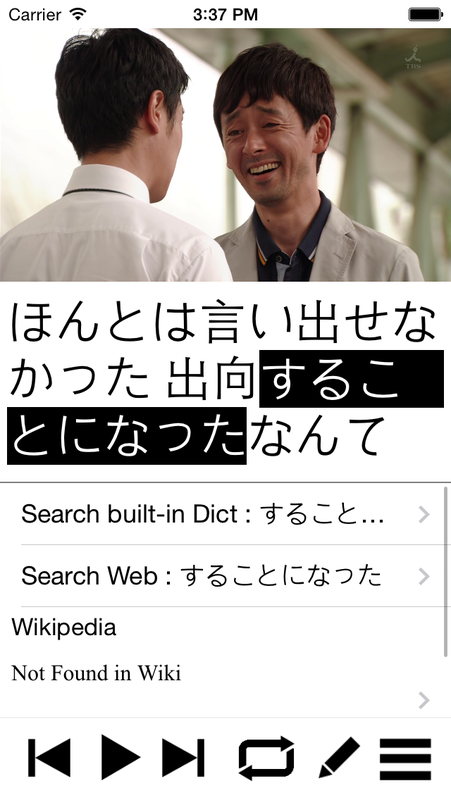 There are chances that the words are dialects. 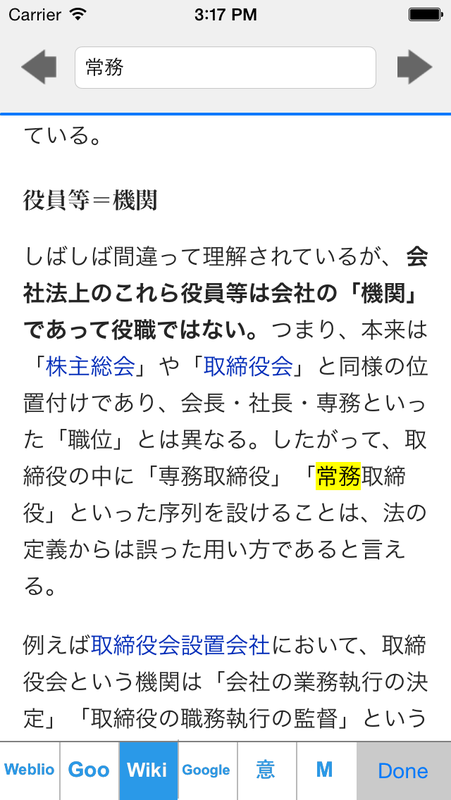 Search the meaning or “意味” in Google can always help. Professional terms and its origin could be possibly found on web.